Hiab, part of Cargotec, has won an extensive order to supply loader cranes to Travis Perkins plc. Hiab will supply five models of folding loader crane, ranging from versatile 4-ton cranes to powerful 14-ton cranes, together with a service and maintenance package. The order has been booked into Cargotec's 2014 fourth quarter order intake. Travis Perkins plc, based in Northampton in the UK, is the country's leading building materials supplier. It has been supplying the building and construction trades for more than 200 years, owns 18 industry-leading brands, including Wickes, Tile Giant and Tool Station, and has 1,987 outlets across the UK and Ireland. Hiab was awarded the contract because it was able to offer Travis Perkins a comprehensive package of bespoke technical solutions that were previously unavailable to the group. "The Hiab product is one of the most innovative and advanced on the market today," said Graham Bellman, Travis Perkins' Director of Fleet - Service. "Plus, their safety systems are industry-leading, and an ideal fit for our business because of the nature of our deliveries to both domestic and industrial premises." Hiab's digital technology is delivering real-time information from the crane, giving vital data on uptime and operational cycles, and also provides live information to the crane operator showing data such as the actual time the crane has been moving, and how many lifts it has made, together with maintenance diagnostic indicators. Safety features such as Power Line Logic, which prevents the crane touching overhead power cables, and the Operator Protection System, which creates a virtual safety cage around the operator to prevent accidental injury, are just some of the features that Travis Perkins specified. 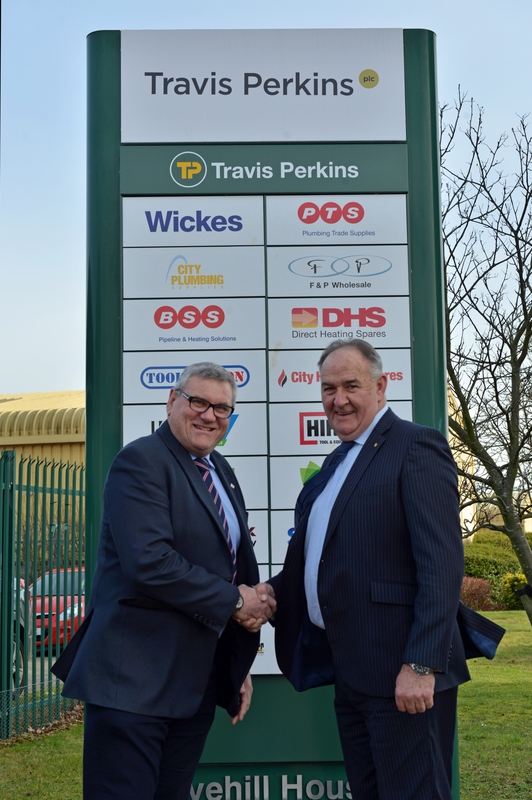 Travis Perkins and Hiab have worked together for over 20 years, with Hiab supplying truck mounted forklift trucks, tail lifts, and terminal tractors to the group during this time. "It's not often you get the chance to feed back to the main board of a supplier," noted Bellman. "Hiab invited us to brief them on our views about the building materials industry, and explain our requirements. We need a minimum eight-year life on the products we specify, together with the all-important service and back-up support, and it was refreshing to know that a manufacturer wanted to work with us to develop a product portfolio to meet our specific needs." "Building a trusting relationship with the customer and providing a service that exceeds the customer's expectations is a key part of our business ethic," explains John Bailey, Hiab's Global Key Accounts Manager. "We pride ourselves on offering flexible solutions, and delivering what we promise. In reality, it's all about teamwork. By having an integrated approach and working closely with colleagues, we can be flexible in addressing the constantly evolving requirements of our customers and be much better equipped to service large corporate contracts."